You only have to look at a map to know that Croxton is a little out of the ordinary. Apart from a back lane which meanders along the edge of the battle training area to emerge near West Tofts, the only road out of the village towards civilisation leads into the town of Thetford. It must be very odd to have the wider world refracted through the prism of one of East Anglia's dullest towns. Croxton itself is pretty, and set along a long, straight road which presumably connected Thetford to Watton before the Second World War and the British Army intervened. Now, it feels rather out on a limb. The road rises to the point where the church sits in its graveyard, and then falls away again. The church is hard against the road, its round west tower lifting to a fairy-tale spire. It would be an exaggeration to say that the effect is like that of a Rhineland castle turret, but it is certainly rather un-East Anglian. To the south is a pretty thatched cottage bordering the graveyard. 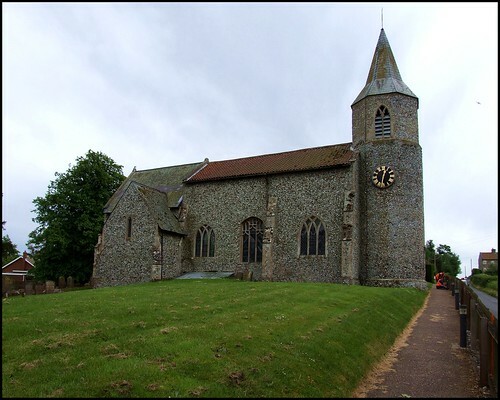 Possibly as a result of the proximity of Thetford, where all the churches are inaccessible, All Saints is kept locked; and, although a keyholder is listed, he wasn't in. This was disappointing. This church was extensively redeveloped in the 19th century, and the interior is by no means as interesting as the exterior, but for one curiosity. Munro Cautley's majestic journey through the churches of East Anglia in the 1930s and 1940s included a survey of the different kinds of fonts he found in the 1,300-odd churches he visited. He noticed what no one appeared to have spotted before: the font here is in the same shape and style as most of the 40 or so known Seven Sacrament fonts, generally considered the height of late 15th and early 16th century English church art. Most of them are in Norfolk, the rest mainly in Suffolk. The panels here are completely effaced, as they are at a handful of other churches; but standing on tiptoe and looking down the length of the south aisle through its eastern window to gaze at the font at the far end, I couldn't help thinking that Cautley was probably right.